Print Size: 12.0" x 9.0"
"I painted this cityscape from Astoria, New York City. 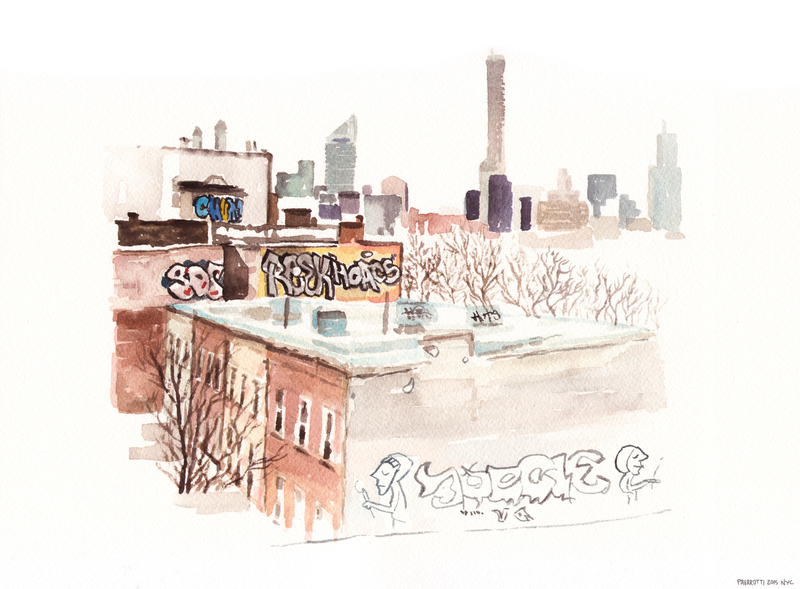 In the foreground you can see some old brownstones covered in graffiti and in the background the skyline of midtown Manhattan with all the high rises. Some trees, with no leaves, are also part of the foreground, revealing that the painting has been done during the cold New York winter." Emanuele Pavarotti studied fine arts in Milan, Italy, with a major in painting. He had his first exhibition there in 2002. Pavarotti started working in character animation in 2004 and since then he has worked on 15 animated and live action feature films, including Harry Potter, Ice Age, and Rio. In 2007 he moved to London, England, to work for the Moving Picture Company and in 2011 he came to New York City to work for Blue Sky Studios: the biggest and most important animation studio in the East Coast. New York has a strong influence on his work: the building patterns, the people walking in the streets, the street dancers and the hip hop culture. There is a strong emphasis in the movement and the gestures in Pavarotti's watercolors, also revealing an influence from his animation work. The paintings are simple and essential, there is an effort in using less brush strokes to tell more. Large parts of the paper are left blank because, quoting Wittgenstein, “I wanted to write that my work consists of two parts: of the one which is here, and of everything which I have not written. And precisely this second part is the important one."